I have a mixed ability class and some of the students refuse to respond to the lessons whereas others are highly motivated. Some of them join us when they feel they can. Isn’t this a common problem for teachers? Aren’t all classes mixed-ability classes? However, a teacher’s task is to make every move possible to reach as many students as she has in the class. I know this is sometimes very hard and sometimes it is even harder. I had a typical mixed ability class of 9th graders. Some were very hardworking who had goals for their future, some were trying hard and another group was just coming to class because they had to. From September to December, I tried games, songs, group work and pair work, but only a small group responded well. I was thinking that there should be a way to reach more students. I had been reading about the flipped classroom, which is basically letting students watch videos the teacher has prepared before coming to the class to work in pairs or groups to learn actively. I decided to give it a try and see if it would work with my class or not. I told my students we would change the roles and they would be the teachers in class in the next lesson, but I also told them that they would have to come to class prepared. -I created an online noticeboard on Blendspace and added a PowerPoint presentation I created, a YouTube video, and some exercises. -I posted the link of the noticeboard on their class blog. -In the classroom, I divided them into groups of three, so that each group was formed of mixed ability students. I told them they had to teach each other how to use comparisons in English. I also told them to use their mobile phones and record their voices while working together and then send me the recordings. I walked and monitored them while they were working. I sometimes stopped and helped them when they needed my help. -Then they participated in a game I created. We played tic-tac-toe. I thought the problem of boredom was solved but the next time I saw them, they were reluctant to watch the videos beforehand. They had many excuses. The Flipped Classroom worked only for a session with my teenagers. Then, they suggested that their maths teacher was giving them points when they did something well. The idea emerged then: why shouldn’t I combine Flipped with Gamification? Those kids were all gamers and “gamification was the use of game-like thinking and elements in places that aren’t traditionally games. The use of game mechanics and dynamics like badges,leaderboards, and actions can be useful for improving motivation and learning”. The next day I had a better plan. I explained that the whole course of English lesson would be a game for them. We arranged the teams. They decided on their team names. I told them every activity would be awarded some points and the winners would get higher marks. I created rubrics for each activity and the whole process was a success. #1Buncee is a web-based content creation tool. You can add in photos, videos, audio, text, drawings and more. You can ask your students to create their projects on Buncee or you can create your lessons online. #2Todaysmeet is another tool that I used a lot last year. TodaysMeet gives you a room where you can connect with your audience. Your audience doesn’t have to register or know anything about technology. You can create a room and decide how long it will be open for. You can ask a question and ask your students answer it before you start a lesson, it can be used to brainstorm or after reading a book, story or watching a movie, you can ask your students to give their opinion or discuss certain questions or even play trivia pursuit in class if you have iPads or a computer lab in the school. #3Blendspace is a web-based content creation tool. You can add content from the web or your desktop directly so you can add a Power Point or a pdf file easily to your canvas. Once finished, you can share it, embed it or print it. #4Padlet, AKA Wallwisher, an old friend with new features, an online noticeboard where you can add your ideas on little sticky notes and then print out the document or save it as a pdf file on your computer. Bio:Eva Büyüksimkesyan is a mother, an EFL teacher, a teacher trainer, social media consultant and the founder of Dream2Edu. She has been involved with many collaborative projects with schools around the world since 2009. 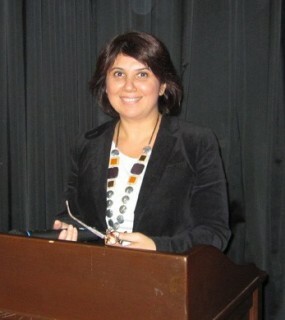 She is the European Union Projects coordinator of her school. She started an e-safety project with her students and organized a student conference with a group of teachers and students, aiming to raise awareness among parents and younger students. She talked about this project at BETT 2015 in London. She volunteered as moderator and course tutor at EVO Digital StoryTelling Course in 2013. She started presenting at conferences both in Turkey and abroad to share the ideas she has collected and compiled through the years. Her journey in her career brought her to a new stop where she decided to have a room of her own to deliver workshops and courses to teachers, parents and children, in short to people who will never give up learning and she started her own educational consultancy firm called Dream2Edu (A Thought Shop as she also defines it). She also blogs at A Journey in TEFL. She is evab2001 on twitter.